Take inspiration from royalty to the timeless elegance of the fifties film stars to keep you feeling like a million dollars on your big day. In the Victorian language of flowers, lily-of-the-valley translates as ‘you’ve made my life complete’, so no wonder it is such a popular choice for the romantically minded celeb! It is only available in April and May, but modern alternatives for year-round sweetly scented blooms are freesia, tuberose and stephanotis. A summer wedding can have gorgeous sweet peas to add a splash of scent, as LeAnn Rimes chose for her pretty wedding posy, mixed in with roses, hydrangea and freesia. Audrey chose a simple headdress of large white roses when she married her first husband, Sean Ferrer, and for her second wedding to Andrea Dotti, chose a scented handtied posy of freesia and lily-of-the-valley. Marilyn held a simple posy of three white orchids when she wed Joe Di Maggio, and whilst Elizabeth Taylor chose the same flowers, she opted for a larger bouquet when she wed Nicky Hilton, her first husband. 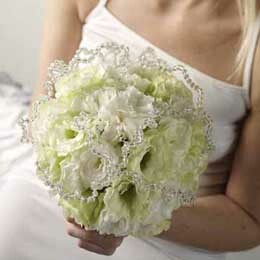 On her wedding day, the star chose gardenias and lily-of-the-valley, which will have smelled gorgeous! Diana chose a teardrop shaped ‘shower’ bouquet of yellow ‘Mountbatten’ roses, gardenia, stephanotis, orchids, lily-of-the-valley and freesia. It also included myrtle and veronica, cut from Queen Victoria’s garden at Osborne House. Yellow, purple and white primroses teamed with lily-of-the-valley, offset by myrtle foliage were carried in a posy by Camilla in her marriage to Prince Charles. Continuing the Royal wedding flowers theme, Autumn carried a tear-drop shaped bouquet of white roses, stephanotis, lily-of-the-valley and freesia. These Royal brides love their delicately scented blooms! Will Kate and Wills break the tradition? Gwen carried a prayer-book covered in white orchids and pink rosebuds in her marriage to rock star Gavin Rossdale. Their wedding reception was decorated with red and white roses.